Meanwhile panic prevailed as the killer goat killed a big cat in Kutressa village. District Forest Officer told reporters that villagers on Monday night alerted forest officials after they discovered a dead cat inside a home. He said a search was launched, but they could not locate the killer animal. An alert has been sounded in the village and adjoining areas, prompting authorities to order closure of schools, colleges and market. Police and forest department had to seek help from army officials in tracing the bovine. 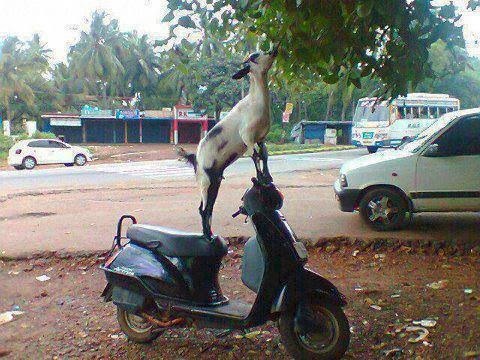 meanwhile according to animal welfare officials, Goats are extremely curious and highly intelligent animals. They are very well coordinated and widely known for their ability to climb and hold their balance in the most precarious places one can only imagine. This makes them the only ruminant able to climb trees, although the tree generally has to be on somewhat of an angle. Due to their agility and inquisitiveness, they are notorious for escaping their dens by testing fences and enclosures, either intentionally or simply because they are handy to climb on. 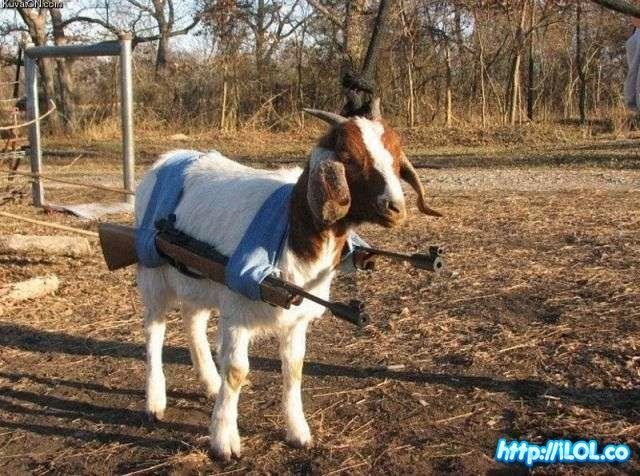 Due to their high intelligence, once a goat has discovered a weakness, it will exploit it repeatedly, and other goats will observe and quickly learn the same method. Goats have an intensely inquisitive and intelligent nature; they will explore anything new or unfamiliar in their surroundings. They do so primarily with their prehensile upper lip and tongue. This is why they investigate items such as buttons, camera or clothing and many other things besides(..you dirty mind) by nibbling at them. Jaggu had laid camera traps for his exclusive operations and was successful in getting the killer's photo. According to latest scientific studies, Humans are actually hybrids or cross breeds, who emerged as an offspring of a male pig!! and a female chimpanzee..(Shakespeare should inspire from this for next magnum opus). Turning the theory of human ancestry on its head, one of the world’s leading authorities on hybridization in animals, has suggested that humans didn’t evolve from just apes but was a backcross hybrid of chimpanzees and pigs. His hypothesis is based on the fact that though humans have many features and behaviour in common with chimps, there are a lot more that don’t correspond to any other primates. while giving examples like slogging on sofa whole day doing nothing, eating what ever is available, nosing around, gets irritated when told be clean. He then suggests that there is only one animal in the animal kingdom that has all of the traits which distinguish humans from our primate cousins. “What is this other animal that has all these traits? The answer is Sus scrofa—the ordinary pig” he says. "who loves eat all types of garbage junk and loves rolling in dirt just like men do" his wife adds. Chinese troops who have been making incursions in Chumar, Rakhi Nullah and Takdip areas in Ladakh almost every fortnight in the past few months, now will be given Adhaar card, ration card, NRI card and a permanent resident visa if stayed for 365 days at a stretch, as per govt notification. Happy singh from punjab has opened Zing Singh's imported automobiles spares shop for chinese tourist vehicles. As per the latest information from the Infosys campus where a call about a bomb planted in the premises led to complete evacuation and early weekend, it is now learnt that a wrong number had resulted in the confusion. Instead of connecting the caller to Bombay (Mumbai) the call wrongly went to Infosys! Police said that the call was made by a maid servant employed at the house in Jail Road. Police sources said that as owner was not home, the maid herself dialed the number to Mumbai and speaking in hebrew asked the person on the other end, "Bombay..Bombay?" The person at Infosys who picked the call, said to be person from Kerala, did not understand the lady's words and wrongly interpreted it as 'Bomb hai' (there is a bomb), which resulted in the panic stampede among innocent and naive employees. By 4 pm, the jubliant employees (thinking of early holiday) began empty the building and when the situation returned to normalcy, employees had left to their native place for early weekend.